Streamline study for Adobe Lightroom proficiency. Is there a better alternative to Adobe Photoshop Lightroom 5 ACE Exam Aid? 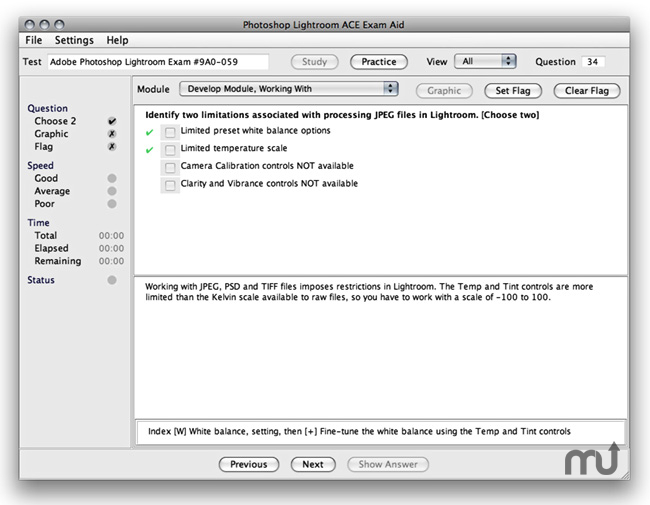 Is Adobe Photoshop Lightroom 5 ACE Exam Aid really the best app in Teaching Tools category? Will Adobe Photoshop Lightroom 5 ACE Exam Aid work good on macOS 10.13.4? The Adobe Lightroom 5 ACE Exam Aid is specifically written in order to help you prepare for and to pass the corresponding Adobe Certified Expert (ACE) product proficiency exam. It is based on the multiple-choice question format. The content is divided into Study, Review and Practice modes in order to make it easier to learn, and to absorb the information. The topics recommended for study by Adobe are comprehensively covered. Extended answers, and relevant hyperlinks to the application's Help pages are included for further study should you require it. Adobe Photoshop Lightroom 5 ACE Exam Aid needs a review. Be the first to review this app and get the discussion started! Adobe Photoshop Lightroom 5 ACE Exam Aid needs a rating. Be the first to rate this app and get the discussion started! You can use the exam aid to test your mastery of Lightroom 5, verify and/or obtain relevant knowledge, track your progress, and gain confidence by practising in an environment similar to the official exam.